Azure Security Center provides unified security management and threat protection across your hybrid cloud workloads. While the Free tier offers limited security for your Azure resources only, the Standard tier extends these capabilities to on-premises and other clouds. Security Center Standard helps you find and fix security vulnerabilities, apply access and application controls to block malicious activity, detect threats using analytics and intelligence, and respond quickly when under attack. You can try Security Center Standard at no cost. To learn more, see the pricing page. In this article, you upgrade to the Standard tier for added security and install the Microsoft Monitoring Agent on your virtual machines to monitor for security vulnerabilities and threats. To upgrade a subscription to the Standard tier, you must be assigned the role of Subscription Owner, Subscription Contributor, or Security Admin. Security Center – Overview provides a unified view into the security posture of your hybrid cloud workloads, enabling you to discover and assess the security of your workloads and to identify and mitigate risk. 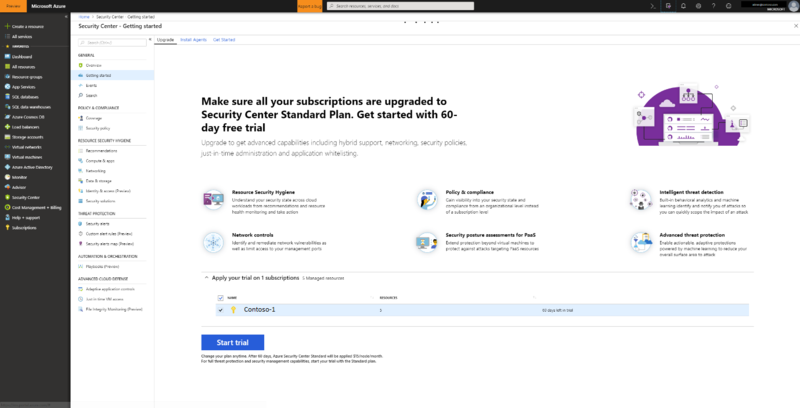 Security Center automatically enables any of your Azure subscriptions not previously onboarded by you or another subscription user to the Free tier. You can view and filter the list of subscriptions by clicking the Subscriptions menu item. Security Center will now begin assessing the security of these subscriptions to identify security vulnerabilities. To customize the types of assessments, you can modify the security policy. A security policy defines the desired configuration of your workloads and helps ensure compliance with company or regulatory security requirements. 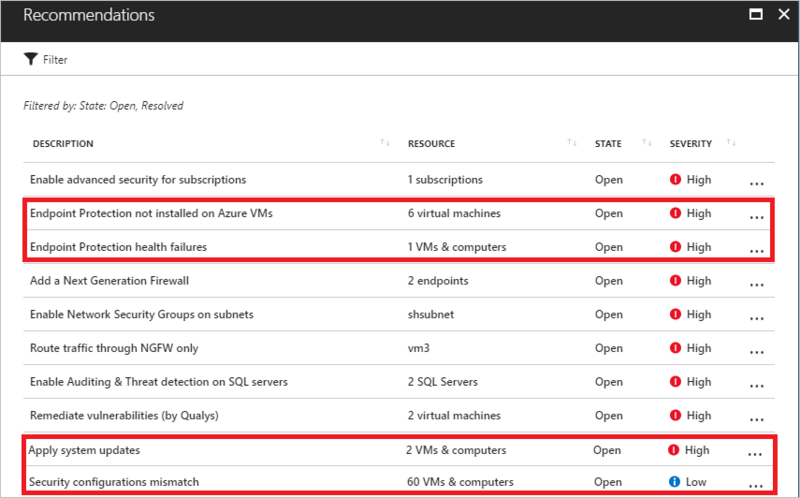 Recommendations for ways to improve the security of your Azure subscriptions. Clicking the Recommendations tile will launch a prioritized list. An inventory of Compute & apps, Networking, Data security, and Identity & access resources that are now being assessed by Security Center along with the security posture of each. To take full advantage of Security Center, you need to complete the steps below to upgrade to the Standard tier and install the Microsoft Monitoring Agent. For the purpose of the Security Center quickstarts and tutorials you must upgrade to the Standard tier. There's a free trial of Security Center Standard. To learn more, see the pricing page. Under Upgrade, Security Center lists subscriptions and workspaces eligible for onboarding. You can click on the expandable Apply your trial to see a list of all subscriptions and workspaces with their trial eligibility status. You can upgrade subscriptions and workspaces that are not eligible for trial. You can select eligible workspaces and subscriptions to start your trial. Click Start trial to start your trial on the selected subscriptions. Security Center collects data from your Azure VMs and non-Azure computers to monitor for security vulnerabilities and threats. Data is collected using the Microsoft Monitoring Agent, which reads various security-related configurations and event logs from the machine and copies the data to your workspace for analysis. By default, Security Center will create a new workspace for you. When automatic provisioning is enabled, Security Center installs the Microsoft Monitoring Agent on all supported Azure VMs and any new ones that are created. Automatic provisioning is strongly recommended. On the row of the subscription, select Edit settings>. In the Data Collection tab, set Auto provisioning to On. 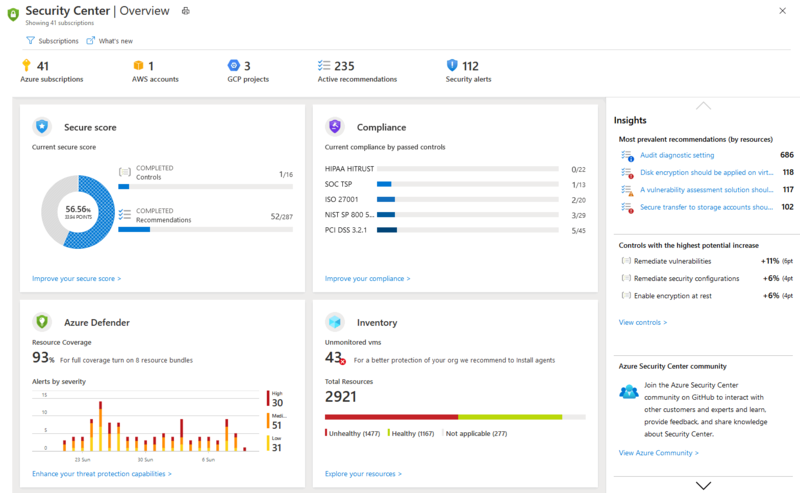 With this new insight into your Azure VMs, Security Center can provide additional Recommendations related to system update status, OS security configurations, endpoint protection, as well as generate additional Security alerts. On the row of the subscription that you want to return to free, select Edit settings>. Select Pricing tier and select Free to change subscription from Standard tier to Free tier. On the row of the subscription you want to disable automatic provisioning, select Edit settings>. In the Data Collection tab, set Auto provisioning to Off. In this quickstart you upgraded to Standard tier and provisioned the Microsoft Monitoring Agent for unified security management and threat protection across your hybrid cloud workloads. To learn more about how to use Security Center, continue to the quickstart for onboarding Windows computers that are on-premises and in other clouds.